This is the fifth book in a stunning series created by poet Helen Frost and photographer Rick Lieder. Each has been a clear and wondrous look at the beauty to be found in nature. 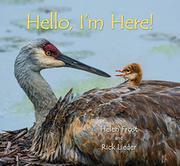 This book tells the story of the early life of a sandhill crane, and its family. The marsh setting is a gorgeous backdrop for the nest built on water, the parents caring for their two eggs, the hatch, and the first busy weeks of discovery. One of the chicks is the narrator, and asks questions and makes comments on those things that concern and intrigue a newborn. From the crowded space inside the shell, to the pecking that releases it, readers watch in awe. Once hatched, it finds its footing, spends time with its mother, and discovers there is another one just like him. Taking steps, feathering out, discovering delectables and swimming as they encounter their surroundings are beautifully presented in stunning up-close photographs. Little ones sharing this book will be happy to know that the parents are constantly caring for and in contact with their offspring. It reassures while teaching. This is another perfect collaboration. I am up for more! Back matter notes on sandhill crane families add quality information concerning these very distinctive birds, their habits, and their life cycle.